With the Clarke range of Garage/Workshops, you can protect your pride and joy from the elements in a tight fit, well-lit, protected environment through ratchet-tight cover tensioning for that drum-tight finish. 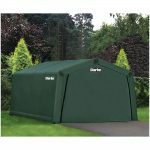 Using a heavy-duty advanced cover that is triple-layered, waterproof, fully UV treated for long term protection against sun, rain and wind, it’s a product that is built to last. The range is easy to install though bolt together hardware and joint supports with a powdercoated steel frame for optimum durability and stability. With various anchoring options, they can be erected on a variety of surfaces. The bright white interiors provide optimum light inside the garage for excellent storage or working conditions. With prices starting from £274.80 and a variety of sizes up to 24ft (L) x 12ft (W) x 8ft 2in (H) this is the perfect range for anyone looking to keep their car safe or seeking extra storage this winter without the vast costs of a fixed garage installation. To view Machine Mart’s full range of garages, use the following link: https://www.machinemart.co.uk/c/sheds/ ENDS. Print article This entry was posted by admin on January 31, 2019 at 9:25 pm, and is filed under News. Follow any responses to this post through RSS 2.0. Both comments and pings are currently closed.